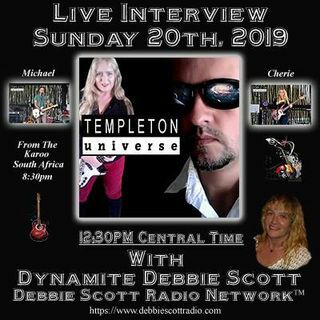 Today I will be Interviewing Michael & Cherie of Templeton Universe via Skype. They hail from S. Africa. We will be talking about their 10 track Album that is a Total Mind Blower that will Rock Your Socks Off !!! Let's Rock !! NO POLITICS, RELIGION OR DRAMA !!! Take care y'all, have a Great Day !! WAIT FOR IT ! ! ! ! ! ! ! ! ! ! ! ! !